Mentors are the unsung heroes of the Rewild Your Child/ Rewild Tribe camps. If you are drawn to this path, just know that it is not an easy one. You give your time, energy, creativity and care pretty constantly for a week. And anyone who spends a lot of time with kids knows that it isn't all unicorns and rainbows. It can be tiring and frustrating. Kids are cruise missiles seemingly designed to press our buttons, and all our mentors need to be able to take responsibility for their own responses. We provide a space for these conversations and for troubleshooting in our mentor meetings and daily debriefs, so you are supported in your own journey as you support theirs. And while it can be challenging at times, the rewards are exponential. Mentors keep coming back because the experience is quite simply magical. Mentors are the vital strands in a basket that we all weave together to create a healthy, functioning community, where we all make a commitment to look after each other, no matter what. ​You sleep in a tent, bathe in a river, and eat around a fire. You wake up to singing and music every morning. You meet people who will be friends for life, hold space for kids to grow in ways they may never have experienced, and bring real, tangible change to the people around you. The quality of your presence and attention is the secret ingredient in the success of these camps, bringing transformation to families in ways that we still hear about years later. At the end of camp you will be different. Bigger, brighter, more skilled, more exhausted, more fulfilled. We have a ratio of one mentor for every 2-3 kids, which is a radical change in the usual childcare paradigm. Normally you'd see one harassed adult for every 15 - 30 kids, and that adult usually spends his or her time in crowd-control, or just playing catch up, instead of having the resources and time for actual quality connection/attention with the kids. On the camps we are interested in what happens when everyone in the tribe has their needs met. This means having enough mentors on hand so that each kid has a voice, and knows that theirs is as important as any adult's. We want to hear from every kid and every adult. Our whole camp is geared up for this. We have LOTS of mentors, so that for at least four hours each day the kids experience truly interested adults wanting to know about them, who they are, what makes them tick, what they actually want to do. And the parents have four hours knowing that the kids are looked after by the tribe's aunties and uncles, so they can finally relax... in the field, or having adult conversations, connecting with partners, going exploring, making new connections, and generally replenish their energy so that wen the kids come back at lunchtime, grubby and happy and brimming with excitement, the parents have had a true rest, and have the resources to meet them. Our mentors are amazing humans. They are all committed to something bigger than them. They bring their creativity, their listening, their willingness, their songs, stories, games and patience. They give up sleep, energy, and time, and are in service, from some deep calling that only they know. Most of them haven't got kids, so they are like super cool older brothers and sisters for the kids. If you are interested in becoming a mentor, there are a few things you need to know. You need to be willing to live in the 'I don't know', rather than thinking you have this mentoring business all figured out. We've been doing this for a while now and are all constantly surprised by what turns up. You have to be willing to change your mind based on what is developing right in front of you now, rather than fiercely holding on to an idea of how something should be. Be prepared to learn, daily, from the kids, the bush and each other. There is no outcome based learning on these camps. If the kids start building a shelter and lose steam halfway through, we don't tell them they need to finish what they started. We follow their energy levels and their creativity. If they want to make fire, the emphasis isn't on getting the fire, it's on the journey of learning fire so deeply that it becomes embodied. Relationship and connection are our most important elements. Everything else flows from there. You need to be willing to use Rapport Based Relating, which means that we don't shout and shame the kids, we build relationship, so that they are making decisions based on quality of connection. We respect their internal authority, and if their authority is a 'no', we listen to that no. We use Coyote mentoring, which means asking questions rather than giving answers, and thus gently guiding the kids to learn from their own experience. We don't solve challenges for them or rescue them by giving them the solutions. And if they get frustrated, we hold them through that, so they learn emotional intelligence. You won't need extensive bushcraft experience. Often the kids will end up teaching you stuff, especially the ones who've been coming for a while. You will need to be comfortable camping, walking through the bush, and dealing with occasional critters like the odd leech or tick. Expect personal transformation. 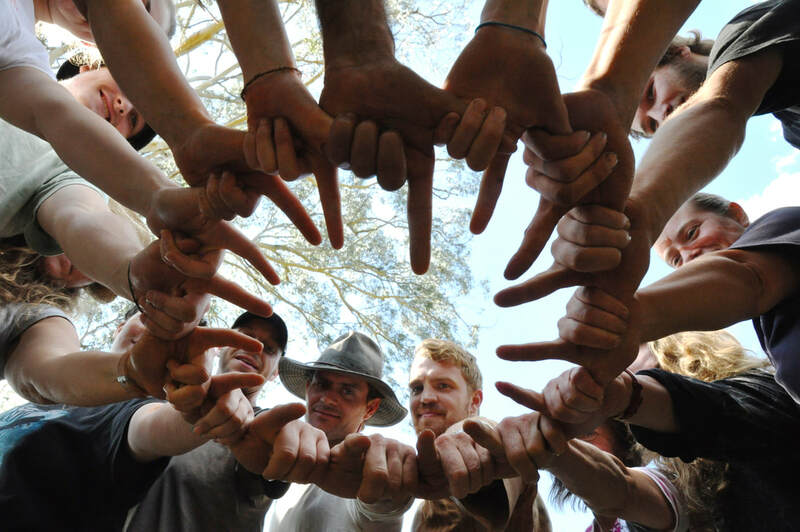 Mentoring with Bluegum Bushcraft is an intensely rewarding experience where it is almost impossible not to be profoundly changed. You will meet some gnarly parts of yourself in your journey of learning to hold space. And we support you as you move through these. The skills you gain are perfect training for moving into holding space in your relationships, any workshops you may end up facilitating, parenting, and generally increasing your resilience in Life. Mentoring with us is a volunteer position. We give you a small fixed travel allowance and feed you dinners every night of the programme and give you discounts on all our adults' programmes like Vision Quests and Wild Heart retreats. You need to bring all the rest of your food, plus your camping gear. There are no drugs or alcohol permitted on camp. At all. Ever. Monday: Family arrival day. Final prep, welcome families, help them get set up, meet kids and parents. Monday: Monday: Family arrival day. Final prep, welcome families, help them get set up, meet kids and parents. Saturday morning: Camp pack up, second stage. Finish by lunchtime. So What Does Mentoring Look Like Day To Day? Your day during the Rewild Your Child Programme will look something like this. 8am - 830am: Mentor meeting. This is a check-in circle, where we touch base and go over what will happen that day. 830am - 1230pm: Village meeting, before the mentors and kids/teens head out for the morning on the Rewild Your Child programme. 6pm: communal dinner then Tribe time; stories around the fires, music jams and bed. Kids are divided into age groups and assigned mentors to spend the week with. Together you form a mini tribe. The Rewild Your Child programme takes place up at the bush camp, which the kids and mentors have been creating and adding to for years now. There is a monkey gym, meeting place, shelters, and from there you can range out into the bush for other adventures. There are many adventures you can go on, from making fire with flint and steel or by rubbing sticks together, to building bush shelters, making cool stuff, weaving baskets, woodworking, stalking, camouflage, making fish traps, skipping stones, painting with ochre from the river, exploring... there is no limit to the fun we all have learning to be at home in the wild. We partner experienced mentors with new mentors, so don't worry if this is your first time with us, you will have plenty of support. In these camps we are making a stand for cultural repair, for kids to experience true human connection and respect, for families to have a place to be real with each other, and for a few days for us all to experience a new way of being human, in a village where we look after each other, no matter what. For some (most) of us, this can be the first time we have experienced this, and this can mean that we can end up feeling things as our old stories are flushed up. Feeling everything in our own bodies as we hold a space for these kids (and adults) to move into creativity, connection, flow and oneness. Feeling our own old stories as they come up in the face of this. Parenting ourselves so we can parent another. And in that moment, changing the world by bringing our presence and awareness into what’s going on outside us (in the kid) and inside us (our own stuff). Our own experience of this can be of a certain degree of discomfort, as everything that is in the way of this movement and the clarity that comes with it, dissolves. The thing that we see, over and over, is that all of the mentors come alive, every camp. For those mentors who have been coming for a while, that transformation is magnified. It's not just the kids and parents who feel the effect of being in a healthy tribe. The mentors do too. Our mentors are amazing. They support each other, rewrite their personal stories, lean into the sharp places, and turn up, over and over in an act so truly selfless it blows us away every time. They choose to be awake, saying yes to what’s really there, doing their best. Without the mentors the camps could not happen. Mentoring is a calling, and we are super grateful to all of those who have mentored with us over the years, and to those who we have yet to meet. If you're keen to join the mentor tribe, check out the dates for upcoming camps. Mentors in the first week come in on the Saturday before camp to help set up, and stay through til Friday afternoon. Mentors on the second week come in on the Sunday before camp and stay til the Saturday to help pack up. See what camp you are interested in. You can stay for both, depending on availability. On the weekend in between camps, mentors can stay on site or head out for supplies, watch a movie, swim in the ocean... whatever you need to defrag. Send an email to Jo at longhouse@bluegumbushcraft.com.au. Include a brief CV, your WWCC status, whether you are an omnivore or vegetarian, an emergency contact number, plus your phone number, address and email, and why you are interested in mentoring with us. Tell us which camp you would like to apply for, or whether you are interested in both for that season. Include any child care experience you have, which can include babysitting, with contact numbers for these jobs. We need at least two references. ​Let us know what you think will be challenging about the role, and what you think will be great. Paint a picture of who you are. We are interested in who you are, rather than what you do. We'll get in contact with you to chat and answer any more questions. If you are called down the path of mentoring, welcome, and thank you. Thank you so much for showing up. For making a difference. For the zillion small things that are actually huge things, and all the sacrifices you make to weave another strand of music in to the magic of this tribe. Bless you.